If you work in a radio news team, it’s time to gather your best bits and submit your entry for the IRN Awards 2019. The annual awards celebrate the quality, creativity and relevance of journalism and includes an additional ‘Reporter of the Year’ category this year to reflect TSAs of over and under one million. 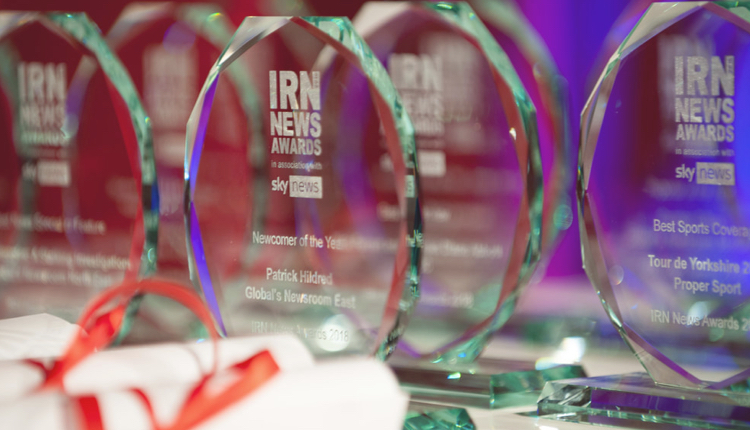 IRN Awards entry is free but only open to teams and individuals working at IRN Newslink client stations – with the exception of the Student Journalist of the Year category – and the entry must comprise material recorded originally between 1st January 2018 and 31st December 2018. The entry deadline is 5pm, Tuesday 8th January 2019 whilst the deadline for the Student category only is 5pm, Tuesday 15th January 2019. The IRN Awards 2019 will be held at Sky Cinema at Sky Central in west London on Thursday 7th March 2019, and are supported by RadioToday.